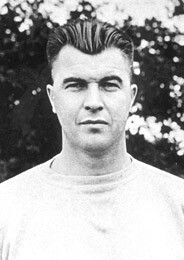 Elton J. Rynearson, former athletic director and coach at Eastern Michigan University, died Feb. 8, 1967. "Rynie" coached every varsity sport at one time or another during his 46 years of service to the University. In his 28 years as head football coach, Rynearson compiled a won-lost-tied record of 114-58-15, including one stretch from 1925 to 1933 when his teams lost only six games. In 1968,the Rynearson Scholar-Athlete Award was founded in his memory. It is given annually to the EMU football player who best combines athletic ability and scholastic excellence.